American talk-show host Oprah Winfrey captivated thousands of fans Monday night in an appearance at Rexall Place, the first stop of her Western Canadian tour. 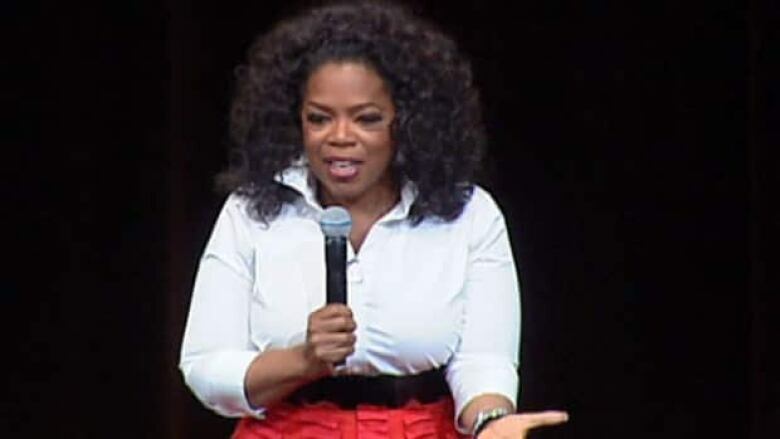 American talk-show host Oprah Winfrey captivated thousands of fans Monday night in an appearance at Rexall Place. Winfrey, whose arrival was greeted by a standing ovation, joked about the city's winter weather in her opening remarks. "The last time I was in Toronto, I was only there for a day so I said, 'You know, I would love to come to Canada. I would love to spend some time in Edmonton. I've never been there,'" she recounted. "Why didn't you tell me to come in the spring or fall?" Winfrey shared lessons and told stories about her life in the style she honed over 25 years as host of The Oprah Winfrey Show. She also talked about the interview she did last week with Lance Armstrong, where the cyclist confessed to using performance-enhancing drugs for all seven of his Tour de France wins. Fans who were waiting outside in the cold at Rexall Place said they loved Winfrey from her years on daytime TV. "I think she touches every one of us," Lisa Huisman said. Her friend Barb Baxter nodded her head. "It's her compassion for everybody." "She reaches out to everybody and her messages are very clear and they're all full of growth," Huisman added. CBC host George Stroumboulopoulous is interviewing Winfrey during each of her three Canadian appearances. He plans to watch and learn from someone who many consider to be a master interviewer. "I want to see how she listens," Stroumboulopoulous said. "She's a great listener and a great talker, obviously. But I want to see how she does it and see if I can catch a rhythm — which is what you want to learn from any guest but certainly somebody as accomplished as she is." Winfrey continues her tour in Calgary on Tuesday and Vancouver on Thursday.